I'm back. 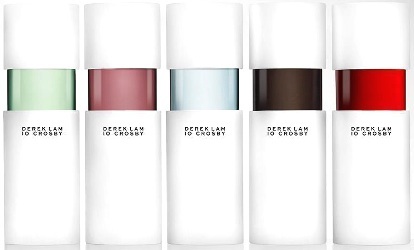 Last week I reviewed five of the ten fragrances from designer Derek Lam's new 10 Crosby collection, and this week I'll be covering the other five. This collection, in case you need a refresher, is comprised of "10 distinctive, modern fragrances based upon one street, 10 stories, 10 moments—all inspired from the world seen and imagined outside Derek Lam’s window at 10 Crosby Street." THE SCENT: Vetiver and neroli. Well, more like vetiver and neroli after they've come back from the dry-cleaner. Weirdly crisp and transparent. I sort of like it. THE FILM: If you were hoping for Melanie Griffith and Jeff Daniels, you'll be disappointed. It's the jilted dancing woman from the "Looking Glass" film, wearing the same satin athletic pants and open-mouthed expression, but she's left the duplex and now she's dancing on the street. THE SCENT: Vanilla and cedar. Yes, this is definitely the vanilla perfume of the bunch. It has a caramel-woody aspect, like a muted Prada Candy, plus a dose of almond — yet it doesn't feel quite finished as a fragrance. THE FILM: An awkward first date in a dumpling restaurant goes wrong, then goes right. This one made me hungry. THE SCENT: Reportedly a jasmine-and-sandalwood oriental, but for some reason it reminds me of Frederic Malle L'Eau d'Hiver (but weaker and sweeter, and made from lower-quality ingredients). Ellipsis never achieves L'Eau d'Hiver's warm/cold enchantment, but I didn't mind wearing it. THE FILM: Emotions ride high during a citywide blackout. With a magical plot device and "Girls"-style ambience and acting. THE SCENT: Chai tea and osmanthus. It definitely has a black-tea note and a hint of some aromatic resin; the osmanthus adds a citrusy floral touch and keeps Blackout from skewing too masculine. However, everything fades pretty quickly after that bold opening. Like several other scents in the collection, this feels like it hasn't really been fleshed out into a finished fragrance. THE FILM: A young woman who's just been dumped by her boyfriend gets drunk with her friends, then creates a bit of a scene on Crosby Street. So, there you go. The 10 Crosby collection is showing up in plenty of magazines this month, and I'm sure its colorful packaging and multi-media marketing will bring lots of initial interest. From what I've seen, I like Lam's clothing designs; I wish these fragrances had some of the fashion's sophistication and attention to detail. Instead, the whole thing feels a bit (pun intended) color-by-number. Yikes, at $100/50 ml. Thanks for doing the research for us Jessica! For black-tea scents, I love L’Artisan Parfumeur Tea for Two and I like Atelier Cologne Oolong Infini…but neither of those is cheaper, alas! I hope someone else has some good tea recs? I can’t recommend Tea for Two enough. It’s sort of a cultish scent around these parts, and, IMHO, a must-try. Late to this party! But if you see this–I also recommend Assam of India. I like Tea for Two, but it doesn’t smell like tea to me… but that is me. The other day I sampled 2 am kiss and said it smelled like cherry musk. I think that’s the same as your strawberry body odor. lol. but I do like it. Now there’s a perfume destined for greatness in the right hands! Lol! Well I happened to saunter through Sephora this afternoon and came across all 10 featured on display. Can’t say I was drawn to any of the actual scents, but the tester bottles (@ 175 ml/ ea) were quite impressive. Agreed, those tester bottles are massive!